Pearl teased us a few weeks ago with this trailer for the company's 'revolutionary' new e-Pro Live electronic drum sets. 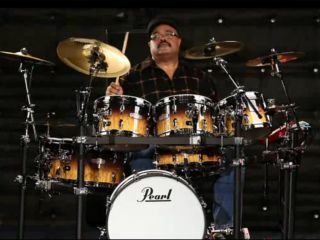 Now, only a few hours from 'show-time' and we've stumbled across this full video demonstration from Pearl's Gene Okamoto, Santana's Dennis Chambers and Slipknot's Joey Jordison. Pearl has used real acoustic shells, hardware, finishes, brass E Classic cymbals and a real rack. In fact, it looks like Pearl has made the most realistic-looking electronic drum kit on the market today. It's so realistic, you can switch the electronic heads to your usual skins of choice and it'll play as an acoustic kit. The Pearl Red Box module sounds quite impressive, too. Watch the video preview and see for yourself. We'll post more as it happens.